Centrum Flavour Burst Adult multivitamin chews help to maintain immune function and good health, and help your body metabolize carbohydrates, fats and proteins. They taste so good, you’ll never forget to take your vitamins again! 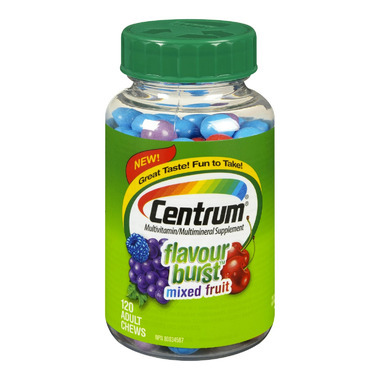 Centrum Flavour Burst is gelatin‑free. Suggested Use: Adults (12 years and older): Up to three chews daily with food. Take a few hours before or after taking other medications. 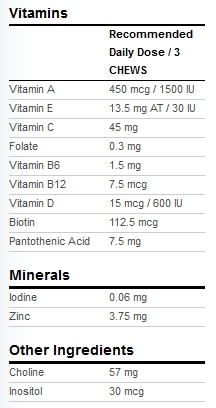 These are the best vitamins ever! They taste so good and itâ€™s hard for me to only eat three! My local drug store suddenly doesnâ€™t have them on the shelf anymore. But I must have these so shopping online! The beauty of this is it doesn't taste like you are taking vitamins....taste like candy. It is quite sweet though. I got a sample of these in my last order and I'm ordering the full size because they were the most delicious vitamin that I've ever tried. I MUCH prefer these to regular adult vitamins. They taste like candy! Might not be good if you are watching your sugar levels though!